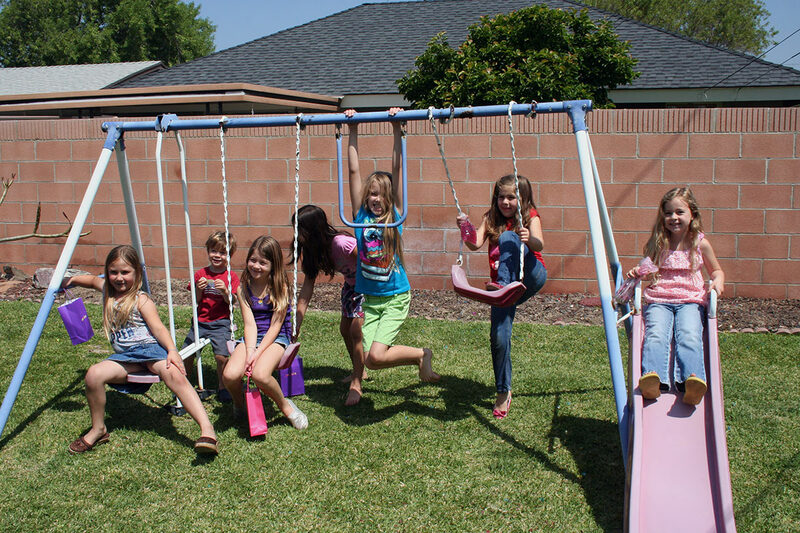 There were just too many memories made at Amara’s 8th Birthday and Slumber Party to capture all in one post so I decided to split them up. You can find Friday Night posted here and Part One of Saturday posted here. I hope you enjoy her party as much as we did. 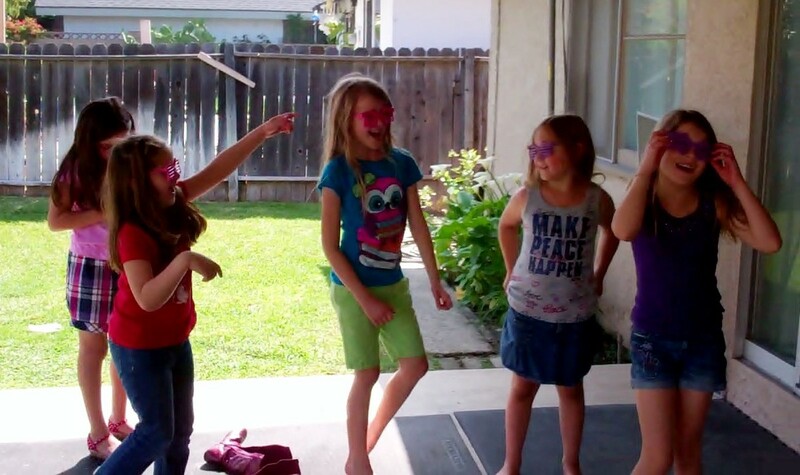 Amara’s Daddy is so good at coming up with games for the girls to play that I had to devote an entire post to what we are now referring to as The Justin Games. A couple of years ago he came up with the Pass the Present Game where he took a small gift and wrapped it in layers. They sat in a circle and each player carefully unwrapped just one layer of wrapping and then passed it on to the next player. Who ever got to the gift won! 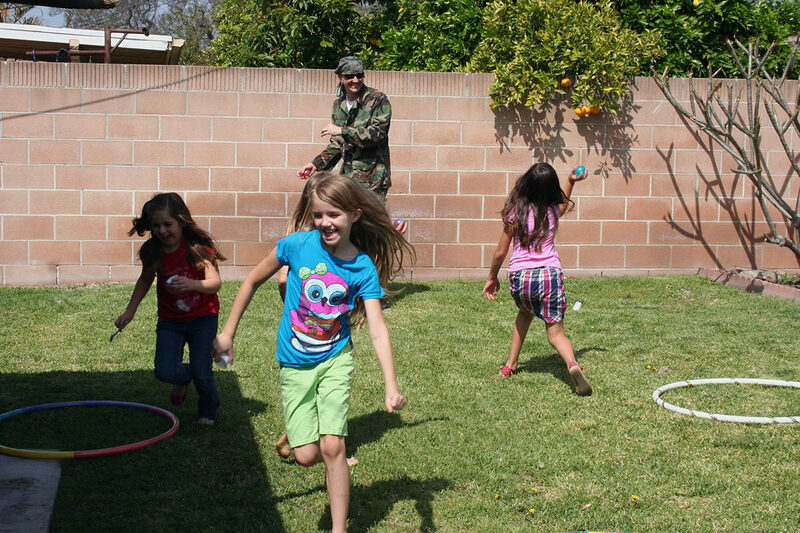 The girls loved the game, it was part of the last couple of birthday parties, and one of our friends used the idea for her daughter’s party. Last year he created the Build Barbie’s Marshmallow Tower Game. He helped each of the kids build a tower for Barbie out of marshmallows and spaghetti. He offered great design advice to the kids and carefully measured the height of each tower. Many marshmallows were devoured and the game was a huge success! This year the first game that Justin had planned was The Photo Scavenger Hunt. Justin is good at scavenger hunt ideas! 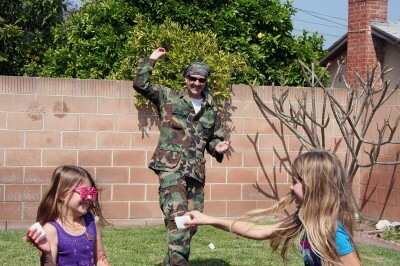 He wasn’t sure if the girls would get into it or not but they loved it. He had gone for a secret walk on our cul-de-sac and made up a list of items for the girls to go out and take pictures of. 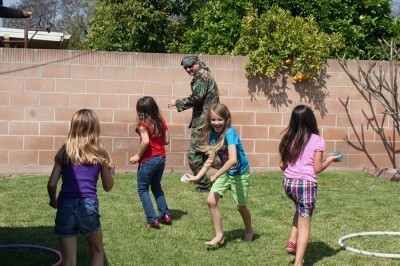 All items were visible from the sidewalk and he asked the girls to be very careful not to walk on the neighbors’ lawns. Once Justin finished explaining the rules of the game, Miss Jenna regaled the girls, at my prompting, with her scavenger hunt story. Did they know that “when Mr. Justin decided that I was the best person in the Universe, and that he wanted to marry me, he sent me on a scavenger hunt”? On her scavenger hunt when she found the last clue it sent her home where he had a candle light dinner waiting for her and where he proposed. I have always loved that story and the girls did, too. Back to their Photo Scavenger Hunt, there were two teams and each team had a Mom as a team leader. They took their cameras and their identical lists and went off to see what they could find! First team back with every picture wins. When they got back Mr. Justin reviewed the digital photos and checked each item off their list insuring they had found everything — his involvement made it so much better! The girls had a blast on their Photo Scavenger Hunt. Next up were The Orbeez War, the reason Mr. Justin had shown up after breakfast in his camouflage fatigues. The girls had fun with the Fairy Jewel Relay Race last year but even more fun later when they started throwing those Orbeez at one another and in particular at Mr. Justin! He knew he had to come up with another Orbeez game. Grampy named it The Great Orbeez War of 2012. This was why Justin had shown up in fatigues, he was going to lead them into battle. This game took a lot of advanced preparation. 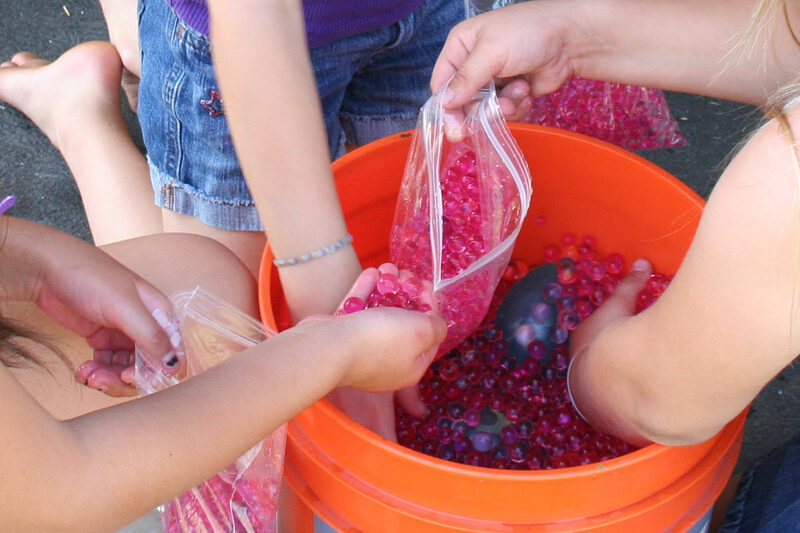 Justin and Amara had filled a bunch of water balloons with dry Orbeez and then hydrated them. They spent the week before her party doing experiments to find the optimal amount of Orbeez to put in each balloon. The morning of the party Justin made sure to drain any excess water out of the bucket so no one was going to get very wet. He had the balloons in a big bucket surrounded by, you guessed it, more Orbeez! Each girl got a chance to fill a sandwich bag full to take home. The girls are just fascinated by the feel of those things. Jenna had gotten the girls the cutest sunglasses to use as protective eyewear. I’m not sure how protective they were but the girls sure looked cute and they were given strict instructions to aim for the body and never at the face. Which is good because they didn’t keep their glasses on! Once each girl had her baggy full and was equipped with protective eye wear the War was on. We overheard Amara earlier plotting with the other girls (when her Dad was out of earshot) that they had to all gang up and throw them at him. 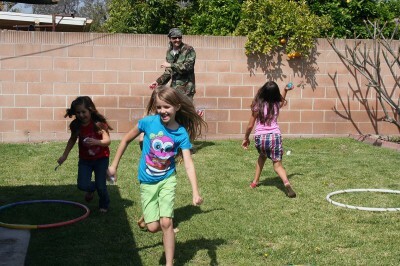 They had so much fun chasing Justin and throwing Orbeez at him and at each other. They had little plastic spoons they could use to launch them and little cups they could fill from the bucket and throw. The screams of delight could be heard for miles. This game was a huge success. When the bucket of Orbeez was finally empty, it was almost time for the Moms to come and pick the girls up. We finished the party off with Popsicles all around and just a little more time on that swing set. It was a wonderful Birthday Slumber Party for our wonderful 8-year-old Amara. This post has been linked to Say it Saturday at Family Home and Life. 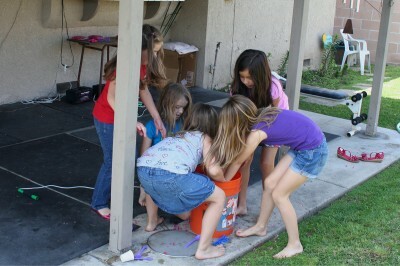 This memory was posted in Special Occasions and tagged Amara, birthday, games, Orbeez on April 30, 2012 by Grandma Kc. An important orbeez tip: The war will last until the orbeez are completely gone. If you make too many, you may collapse from exhaustion while little girls are still pelting you. 5 gallons was just about right. Oh my gosh!! That sounds like so much fun! 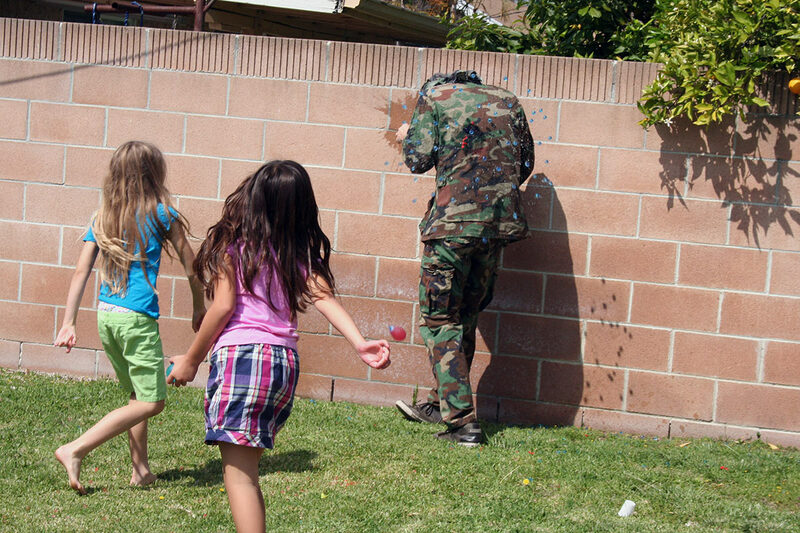 I really have to have an Orbeez war; the kids will never forget it. I have never heard of Orbeez, what are they and where do you get them? I should have put a link to the Orbeez site. Orbeez are very small, about the size of a dried pea – until you put them in water! This link explains them the best: How to grow Orbeez . You can get them at Target and Amazon among other places. You will have a blast! This is such a fun age. Such fun and wonderful memories for all! Thanks so much for sharing! I had not heard of Orbeez, either, but like a tech-savvy Grannie, I Googled it! It sounds as if the Justin games were a great hit! So much fun!! Love it. Fun games. I admit I’m a wee bit fascinated by Orbeez myself. Omgosh! What a wonderful guy/dad Justin is. He certainly put in a lot of extra work to make sure Amara had an over-the-top fun party. I bet when she is a grandma, she will still be telling “Justin/Dad” stories! And like the others, I too checked out Orbeez…thanks for the info. Wow! My girls would have LOVED to have you be the host/party planner for their slumber parties. If (when?) I have granddaughters, I just may have to steal a few of these ideas. Or invite you to join us. Love the Orbeez. May need to get them for my oldest grandson’s upcoming birthday party. Great fun and awesome photos! I have really enjoyed all the posts about Amara’s birthday party. What great memories y’all are making for that young lady and for yourselves. I especially love how involved Justin was in the party. So many Dads are just not as involved with daughters as they are with sons. I know I’ve seen Orbeez at Target but had no idea what to do with them. As soon as Her Highness is a little older, I will be buying some for the girls to play with when they visit. I loved the photo scavenger hunt idea! I’m so glad Jenna shared the story of the special scavenger hunt Justin prepared for her! Wow! What greata fun! Justin should have a side business for kids’ parties! I’m printing these out for my grkids’ parents: (one tries to find a place to handle it all….the other says house parties only….but what to do???) They both will love this….especially if I help put in the prep ahead of time. Re: camera scavnenger hunt….did girls bring their own or were they provided? Did I miss something? Your kids are great fun, Kc…..they’ve learned from the best….YOU!!! What a riot! Any kid would love this, boy or girl! I think I’m going to have to investigate Orbeez…the kids would go nuts with them! And me, too. I’m impressed with Justin’s enthusiastic involvement with his little girl’s parties. My husband is a great daddy, but he’d feel awkward and disappear when little girls begin to fill up the house! After they left, he’d show up again to clean and look for leftover cake! Oh what a fun sounding party. Thanks for the fun ideas for special days and just plain fun grandkid days. Have a lovely Easter!